The International Theatre Institute ITI, is an NGO in formal associate relations with UNESCO, and one of its core values is education and training to enhance the skills of beginners and professionals in the performing arts. 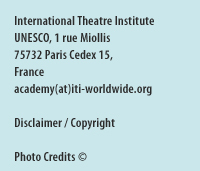 In view of the above, ITI is launching the ITI World Performing Arts Academy (WPAA) - an international platform for training and exchange in the different disciplines of the performing arts, organized in cooperation with international ITI members and coordinated by the ITI General Secretariat, based at UNESCO, Paris. ITI members and non-profit cultural associations can propose a training project, independently or in collaboration with other organizations, choosing from the pool of proven international performing arts experts and masters available here (currently under construction). We invite you to explore this website and find out more about the aims of the Academy! Feel free to send us your comments and suggestions.